This magnificient planetary is another prominent northern object missed by Charles Messier and discovered by William Herschel, on February 15, 1786. 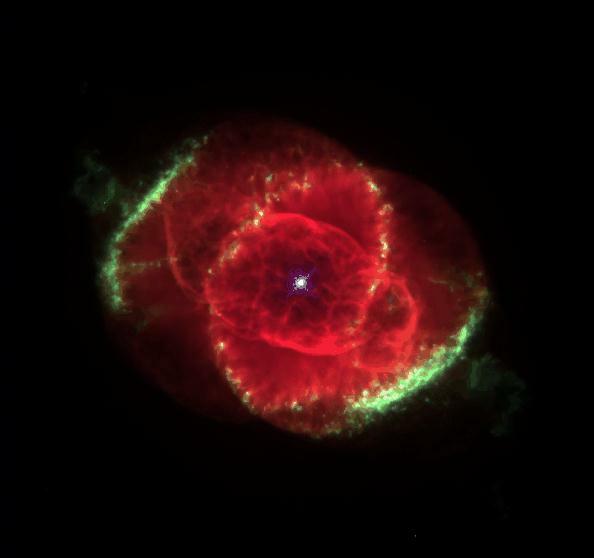 The Cat Eye Nebula was the first planetary which was spectroscopically investigated and displayed its typical (and peculiar) line spectrum, by the English amatuer astronomer William Huggins, published originally in the Philosophical Transactions of the Royal Society (London) in 1864 - in the same volume where John Herschel published his General Catalog (GC) of 5079 entries for deep sky objects. (Huggins 1864). NGC 6543 is situated almost exactly in the direction of the North Ecliptic Pole. This means that the normal vector of Earth's orbital plane (and also the total angular momentum vector of our solar system) points to a direction very close to this nebula, and that those diagrams of planetary orbits in the yearbooks and magazines represent the view of them from this planetary. Our image was obtained by the Hubble Space Telescope (Project scientists: J.P. Harrington and K.J. Borkowski, University of Maryland). A higher-res version and caption (html) as well as Press Release text (PR 95-01a) is available. An enhanced b/w version of this image was released at the same time (PR 95-01b). While the nebula, with its 20 arc second diameter, is rather small, it has an extended halo of matter the progenitor star has ejected during its red giant phase. This halo measures 386 arc seconds (5.8 arc min) according to observations of A.G. Millikan (Astron.J. 79, 1259, 1974). Bill Arnett's Cateye Nebula NGC 6543 photo page, info page. In the SAC 110 best NGC object list. Caldwell 6 in Patrick Moore's list. In the RASC's Finest N.G.C. Objects Objects list. The ISO infrared space telescope has investigated the Cat Eye nebula in the infrared light. William Huggins, 1864. On the Spectra of some of the Nebulae. Philosophical Transactions of the Royal Society of London, Vol. 154 (1864), p. 437-444.